We Want to Support You, Our Local Literary, Musical and Visual Artists! Heights Arts is always looking for new artists from Northeast Ohio to promote through our ongoing Literary, Music and Visual Arts programming. 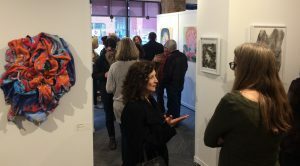 We aim to connect these groups with audiences by providing exhibitions, concerts, poetry events, a year-round and Holiday Store, and programs which support the creativity that is our community. Interested in curating or being part of an exhibition? We accept proposals for guest curators and exhibitions year-round, from individuals as well as groups residing in Northeast Ohio. All proposals are reviewed bi-monthly by our exhibition committee. You may submit a proposal online from this page; please contact exhibitions@heightsarts.org or call us at 216-371-3457 if you have any questions about the process. Proposals must be completed and submitted online in a single session; we suggest preparing your materials before you begin the process. Compensation: Artists receive 60% of commission on works sold in the gallery space, with 40% going to our non-profit organization. Located in the popular Cedar Lee entertainment district and open five days a week year-round (every day in November and December), our shop sells and markets the creative output of Northeast Ohio artists & makers on a consignment basis. We are continuously looking to showcase our region’s creative bounty, including: items for the home in ceramics, glass, wood and metal, jewelry, artist-made note-cards, prints, photographs and works on paper, textiles and artist-made wearables. Have something else not on this list? Contact us. We’d love to hear from you. 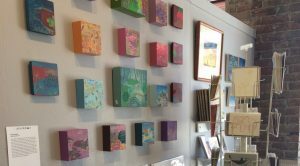 Compensation: Artists receive 60% of commission on works sold in the art and gift store, with 40% going to our non-profit organization. For smaller items such as artist-made cards or buttons there is a 75%/25% commission split. Heights Arts is once again hosting the fun, funny, irreverent Haiku Death Match, and currently seeks contestants to participate. This ever-popular event, with the Haiku Master chosen by the audience, will take place at the Alma Theatre, Saturday, August 3 at 7 pm. Up to 10 people (8 contestants and 2 alternates) will be chosen by lottery to hurl their deadly word weapons against each other in themed rounds. 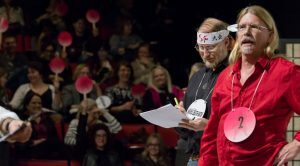 Battle to the death (or until you’ve finished your haiku) to win the audience’s favor and be voted this year’s ultimate Haiku Master! Not to mention you get to take home the most coveted of cheesy trophies! Come on! Be the first to throw your hachimaki in the ring! Please click the APPLY button to complete the online poet entry form as soon as possible to be one of the chosen 10. We will be accepting applications for contestants age 18 and over, through April 15. Once chosen, the 10 contestants must attend an orientation meeting to review the rules of the competition and the structure of the event. Tickets for the 7th Annual Haiku Death Match will go on sale to the public in June, 2019. Our Call for Musicians is currently closed, and will re-open in Fall of 2019 for our 2020 season. 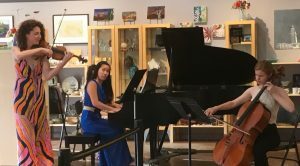 The 2019 call for musicians has opened for our series of classical ensemble performances. These concerts offer a free musical experience to the community while still supporting local musicians! The group performances are held in our acoustically vibrant exhibition space with the season running from January through October. Interested in performing in our gallery? Performers can complete the online submission form below, with included video clip. We are scheduling between January and end of September, 2019. For more information on gallery concerts, please contact us at 216-371-3457. When: June – August application period for January through October season. Compensation: Musicians will be paid an honorarium of $250.00 up to $1,000 per group for a performance.